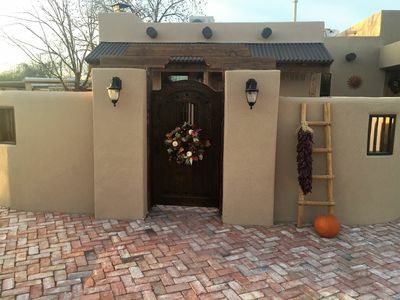 Come escape to Southern New Mexico with this beautifully charming Mesilla vacation rental casita, nestled beneath the Organ Mountains. 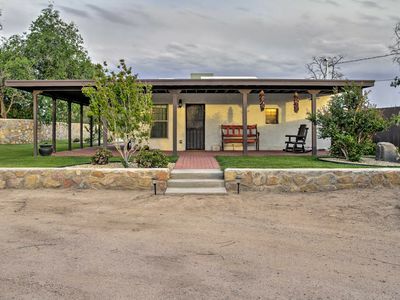 Whether you're looking to relax in the desert sun or explore the area's rich culture and history, this wonderful 1-bedroom, 1-bathroom home will serve as the ultimate setting for your upcoming New Mexico getaway! Discover your own private oasis at this gorgeous guest casita, nestled beneath the towering Organ Mountains and only minutes from Old Mesilla Plaza. With enough room to comfortably sleep up to 2 guests, this residence is the ideal accommodation choice for solo travelers, friends, or a romantic couples getaway. 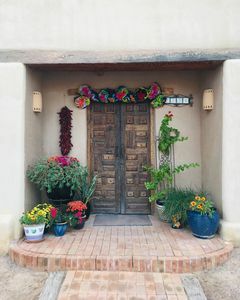 The casita’s remodeled interior welcomes you with a warm and inviting ambiance, boasting a distinctive mix of antiques, eclectic artwork, and updated furnishings. 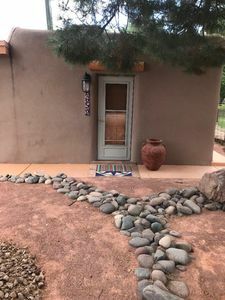 This casita truly exudes an old adobe feel, while offering all the modern conveniences of home such as air conditioning, cable TV, wifi, and in-unit laundry machines. After a memorable day of exploring Mesilla, you'll love relaxing in the cozy living room to watch your favorite movies on the flat-screen cable TV with DVD player. Prepare delicious tapas and cocktails in the fully equipped kitchen, which comes complete with all the necessary appliances, granite countertops, and a small kitchen table for 2. Evenings are best spent on the large covered porch that overlooks the lush lawn and property grounds - it's the perfect spot to sit and enjoy the peace and quiet. 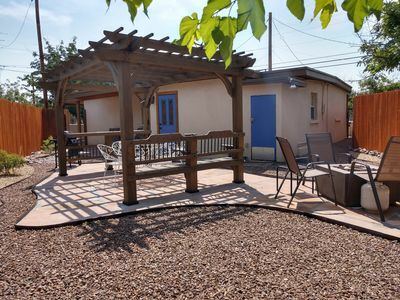 One of the best features of this terrific casita is its prime location! Enjoy the convenience of being within 10 minutes of New Mexico State University, Sprouts Market, and incredible New Mexican cuisine. You'll also be an easy 10-minute walk from the Plaza, where you can discover everything from great local restaurants and charming shops, to fine art galleries and the stunning Basilica of San Albino. Additionally, walking around town will let you truly absorb the vibrant history, architecture, and natural beauty of the old Southwest. Outdoor enthusiasts will certainly enjoy hiking through the magnificent Organ Mountains, whose petroglyph-lined canyons once played refuge for the famous outlaw Billy the Kid, and warrior Geronimo. To explore the area further, drive 45 minutes into Ruidoso, a favorite mountain town, or downtown El Paso. 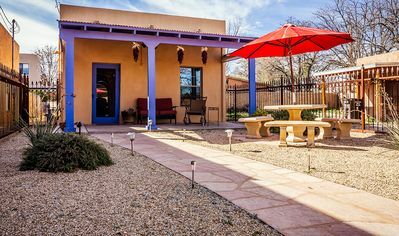 No matter how you plan to spend your time during your Southwestern escape, this enchanting Mesilla vacation rental casita will not disappoint! - Fantastic Mesilla location, an easy 10-minute walk from restaurants, art galleries, and shopping at the Plaza! 45-minute drive from Ruidoso and downtown El Paso!